Heritage Industrial Services, Inc. (Heritage) – a nationwide rigging and dismantlement contractor was contracted to assist with the rigging of the oldest white oak tree in America. The white oak tree was located beside the Basking Ridge Presbyterian Church, where it already stood for nearly 300 years before the church was built in 1717. Famous English evangelists James Davenport and George Whitefield preached to more than 3,000 people beneath the tree in 1740. George Washington picnicked under its shaded tree branches. While the care of the tree was closely monitored over the past several decades, it showed more pronounced signs of aging in the last decade. In the 1930s, a large cavity inside the tree was filled with 3 tons of concrete and the local water company installed 260 feet of steel rods and 1,500 feet of steel cables to support the weight of the tree’s branches. Unfortunately, after years of trying to preserve the tree it began showing signs of decay and was declared dead last year. The church decided it was time to chop down the tree before it fell on its own. 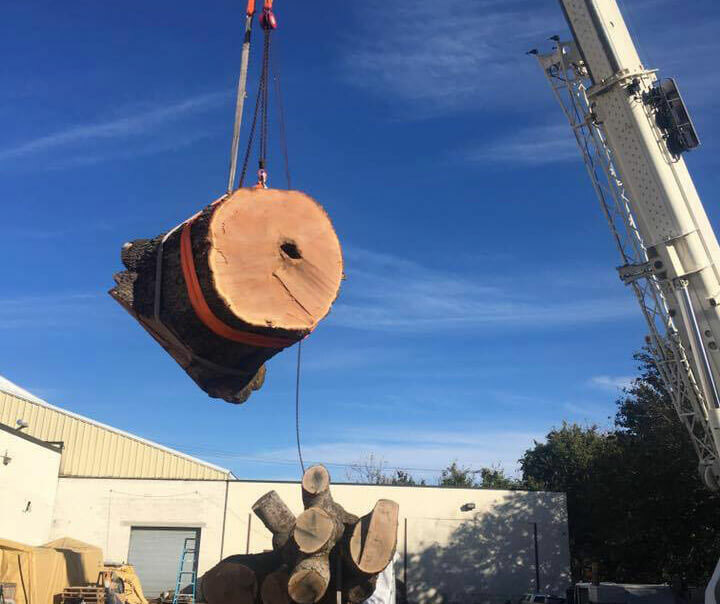 After being cut down the tree was transported to a NJ master furniture maker to turn some of the tree’s massive trunk into a limited series of custom tables, including one with a Revolutionary War musket ball embedded in it. Prior to performing the work, extensive preplanning and safety measure were taking to ensure the safety of our employees and the protection of the historical tree. Heritage assisted during the initial break-cuts utilizing various rigging and a crane to support and lift each section after being cut. After the sections were cut free they were lifted and staged in a designated area. Based on the size and magnitude of the tree, after working a 12-hour day with six men it only resulted in a single cut being made. The remaining sections of the tree were cut and staged utilizing the same process thru out until complete. Heritage takes great pride in being involved and entrusted with such a historical and important project. We look forward to viewing the final limited desks that will be handcrafted from this historic piece.